Sliced and served with a dollop of hand-whipped whipped cream. Yummeh! Right now, I’m sitting on my sofa, typing away at my laptop and smelling the delicious smells emanating from my kitchen. I am also studiously ignoring the disaster zone that my kitchen has become. There are sinks (plural!) of dirty dishes, spreading out to cover part of the kitchen island as well. There are spatters of jam, sugar, and unidentified sticky substances all over my stove top. There are several cookbooks spread out, a 10 kg bag of flour, and a flat of canning jars in the general vicinity too. Also fixings for tomorrows lunches, but I’ll ignore that for now. How did my kitchen become Cooking Collisions Central? Well. Let me tell you! Every two weeks my online bake-a-long group makes another recipe from Dorie Greenspan’s cookbook, Baking Chez Moi. This means that we make about two recipes a month. But when a month has 5 weeks, it’s REWIND TIME! I.e. if we’ve skipped a dish, or want to rework a recipe, or simply make it again but better, that’s what we do. Fresh fruit, yo! Also suspiciously unlike rhubarb. As it’s rewind time this week, I decided to make the Rhubarb Upside Down Brown Sugar Cake that I had made before, except this time I planned to actually use rhubarb, as opposed to pineapple. For some reasons, rhubarb seems to be hard to find this year, but I finally tracked it down in a fruit shop at a plaza near my home. I’ve been craving rhubarb and was so excited to make some yummy cake! I haven’t baked in several days as I was camping this weekend (interruption to scratch annoying mosquito bites) and I was in baking withdrawal. I won’t count the Schoolhouse Buns (look for this in a new post!) that I made last night at midnight — that merely took the baking edge off. So I thought to myself, what shall I make? I thought it might be nice to send something in to work with the DH, and it’s been a few weeks since I did that, so I started making cashew brittle. Which was all fine and dandy, until my candy thermometer exploded. That was slightly stressful. But I opened the windows, turned on the fan, wiped up the drips and spills, and tossed out the thermometer innards. I also googled “thermometer poisonous”, but couldn’t find a definite answer, so I shook it off and returned to my kitchen with the single-mindedness of kitten on catnip. I couldn’t resist the lure of the canning jars — I had to make Strawberry Rhubarb jam. 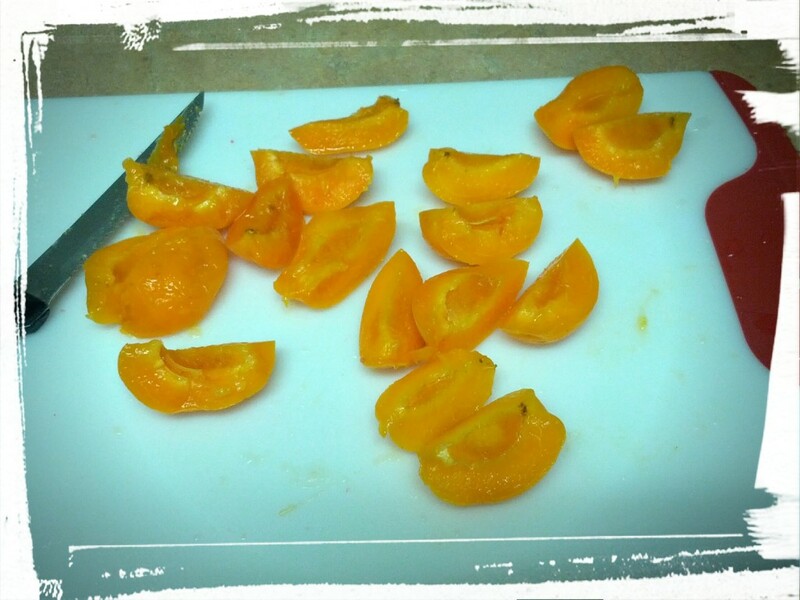 And then I was snacking on apricots as I was boiling up the jam, and I thought hey, this would be nice in place of rhubarb for Dorie’s Upside Down Brown Sugar Cake! So I started mixing that up as well. 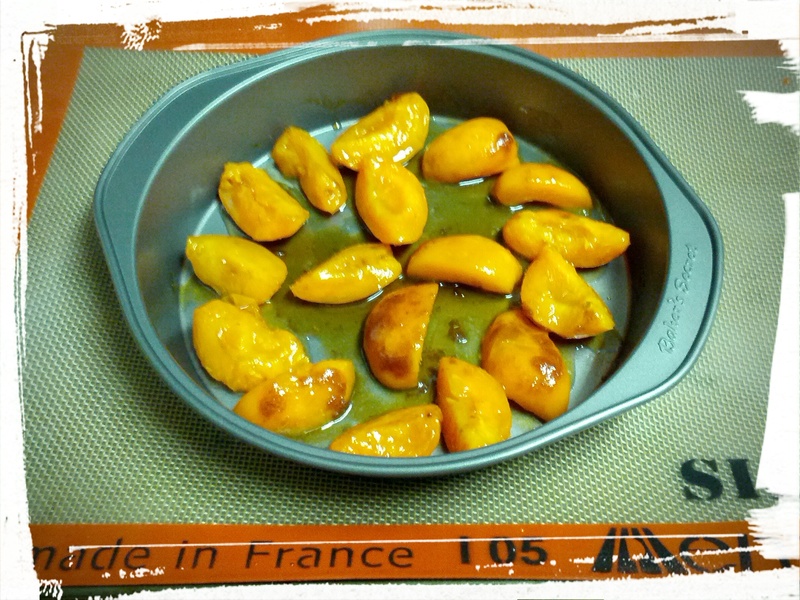 I was caramelizing the apricots at the same time that I was sterilizing the canning jars, and trying to prepare lunches for the next day too. The DH and I have very different approaches to tasks: I tend to prefer to do several tasks at once, as evidenced by my multi-tasking cooking style, while he is very linear and likes to complete one task before going on to the next one. My approach drives him crazy, so he’s learned to keep out of the kitchen when I’m in it. Once he realized that I was going on a baking binge this evening, he wisely absented himself, and I haven’t seen him since. He also hasn’t seen the disaster that is the kitchen, so it works out! Taste testing waits for no one. Also, given that I was taking this picture at midnight, I feel that I have to point out that it was more glossily glazed in real life. And luscious. Have I mentioned the lusciousness? 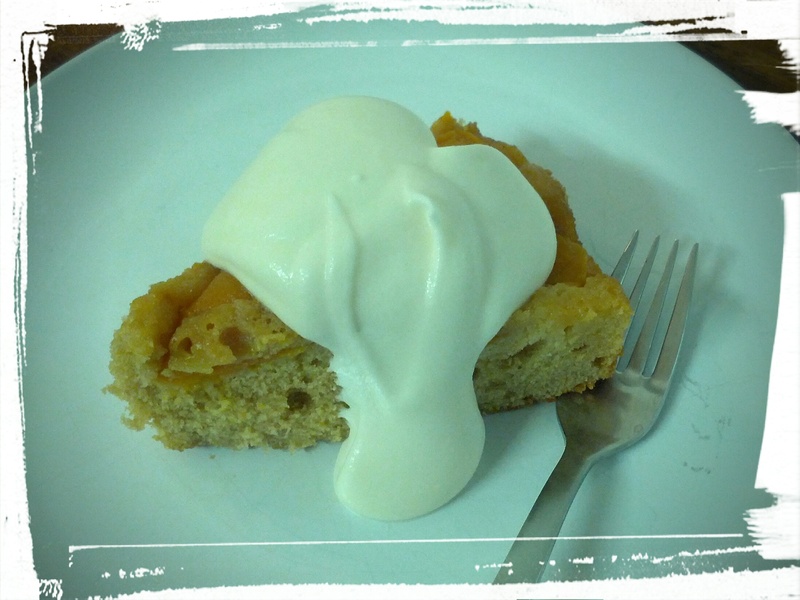 So breakfast tomorrow shall be Apricot Upside Down Brown Sugar Cake, served with a dollop of nicely chilled whipped cream! Also possibly for lunch. And for snack. And for dessert after tomorrow’s dinner. At which point I *may* consider myself sufficiently fortified to tackle my mountain of dishes. Or…not. Next Post: Schoolhouse Buns! And what to do with leftover milk powder. This entry was posted in Cook-a-Longs R Us on June 30, 2015 by Margaret. For this week’s Memories of Meals Past post, I’m writing about panna cotta, that fancy-pants dessert. 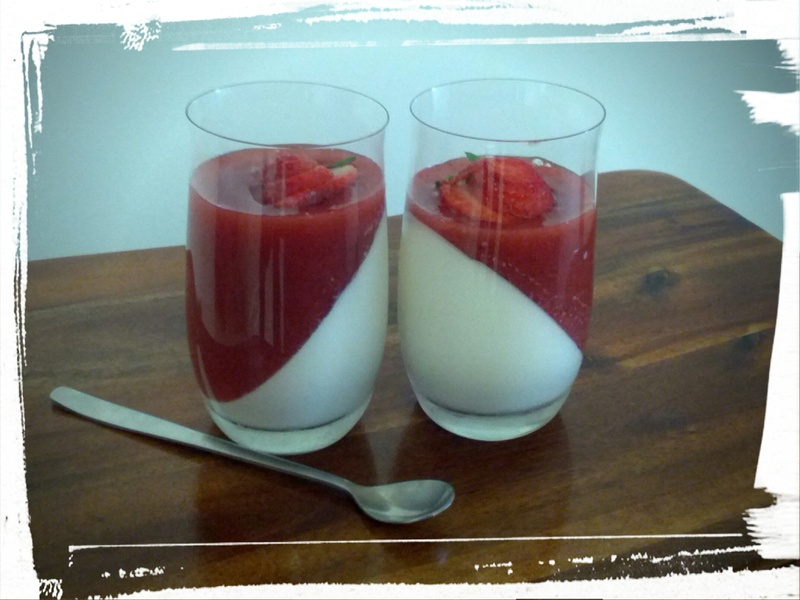 I’d always heard of panna cotta, but never knew exactly what it was until this year, when I came across several recipes for it. Basically, it’s a cream jelly. It makes for a pretty moulded dessert, and is often served with a fruit coulis. Apparently, it originated in northern Italy, where it was made by boiling fish bones with heavy cream. The collagen from the fish bones turned the heavy cream into a gelatinous pudding. I.e. cream jelly. But don’t worry, it tastes better than it sounds! It’s actually really delicious, unless you’re a vegetarian, like me, in which case, don’t eat it, but use a gelatin substitute instead. And never fear, no fish bones were used in the making of this dessert. I did, however, use gelatin, simply because I had it in the house. Gelatin isn’t veg-friendly, so please use a substitute (agar-agar?) if you’re vegetarian. 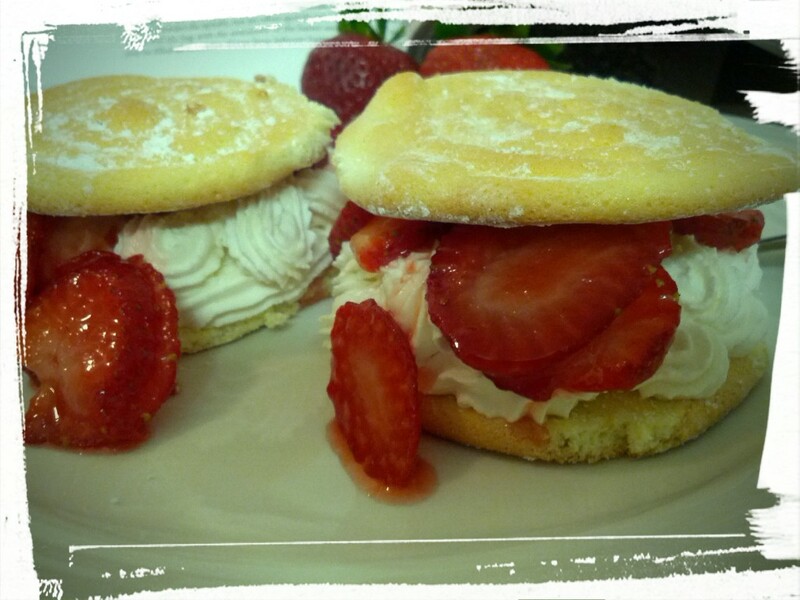 The DH thoroughly enjoyed this dessert, and I enjoyed making it for him, so I think we were both winners in the end! And the strawberry coulis was very tasty — that, I can vouch for! Want to whip some up yourself? Let’s! Let the gelatin ‘bloom’ by sprinkling it over a cup filled with 1/4 c. of water. Once it’s absorbed the water, dump it into a saucepan and add the cream/milk mixture, as well as the sugar. Heat until both the gelatin and the sugar are dissolved. Stir in vanilla extract. Pour the panna cotta into your serving dishes. I tilted the dishes (glasses) that I used by resting them against a head of romaine lettuce in the fridge so that they looked all fancy-pants, but hey, you do you! Then let the panna cotta set up, preferably overnight. To serve, top the dish with a chilled berry coulis (berries and water and sugar all boiled up and blended). Chill until served. Enjoy your delicate dessert! Pro Tip: To cover the panna cotta with berry coulis but without damaging the delicate jelly, pour the coulis over the back of a spoon that is held over the panna cotta. Easy, peasy! This dish is easy, pretty, and delicious, so if you’re looking for a dinner party dessert that you can make ahead, try this one! It’s pretty healthy (if you ignore the sugar), and it’s a nice, light ending to a meal. Enjoy! Next Post: Back to France, or at least my French baking group, for a variation on a theme. Maybe with rhubarb, maybe with cherries. I’ll see what I feel like when I’m back from my camping trip this weekend! Edited to add: I’m trying something new to bump up my posts/page views. I’m taking part in a link up organized by Christy Jordan of SouthernPlate.com. Check out my link and other yummy recipes here! 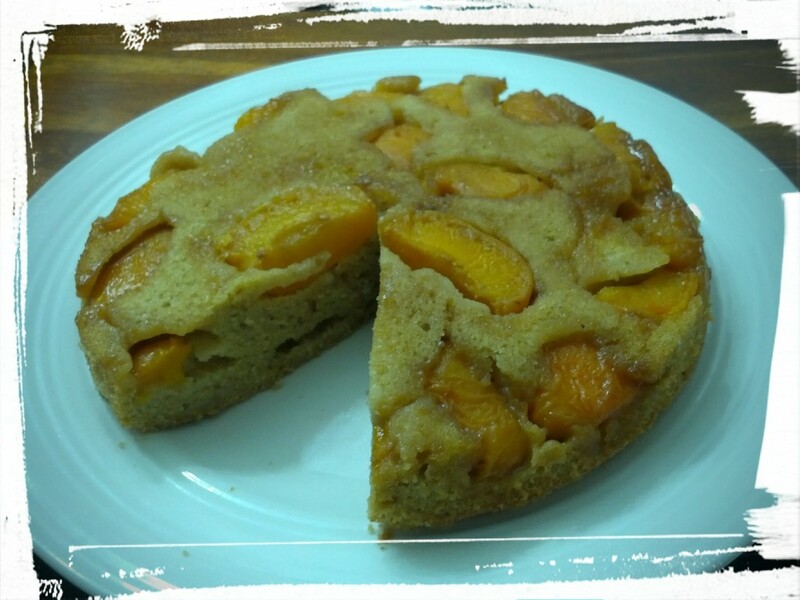 This entry was posted in Desserts Not Otherwise Categorized on June 26, 2015 by Margaret. 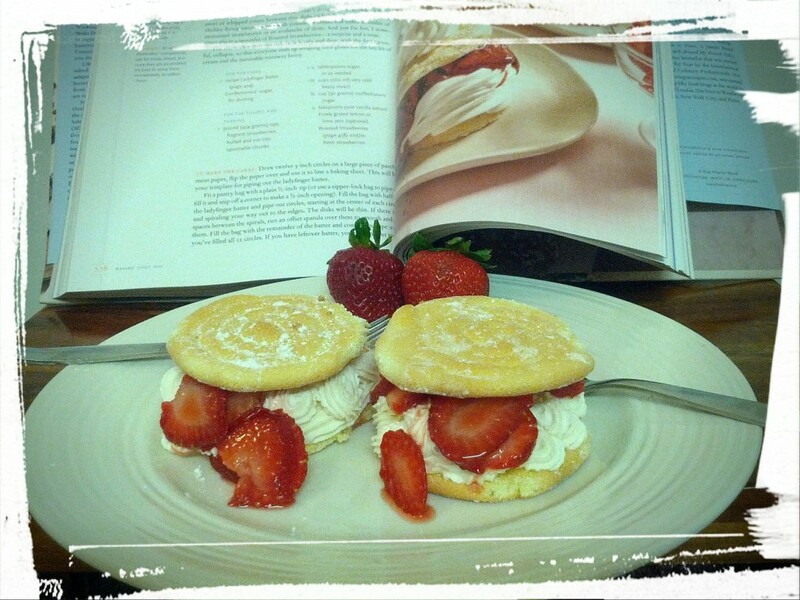 Today’s bake-a-long recipe is Dorie Greenspan’s “Franco-American Strawberry Shortcakes”, from her Baking Chez Moi cookbook. I’m writing this after partaking in the (very tasty) fruits of my labour, so I’m sitting on my sofa, tapping away at my laptop, with a happy tummy and a satisfied smile on my face. If I was a cat, I’d be purring. Tl;dr: Strawberry shortcake = yum. Strawberry shortcake is a quintessentially American dish, I think, although it seems to have had it’s roots in the England. 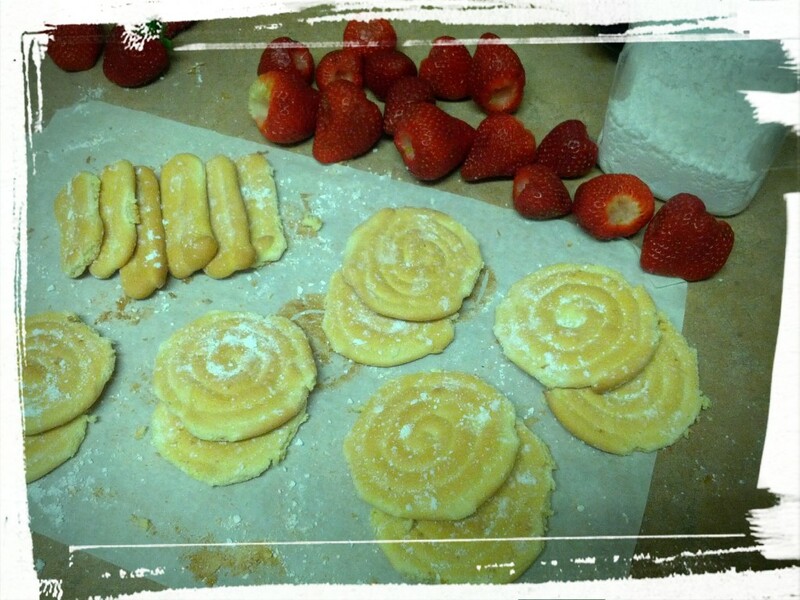 Dorie takes the standard biscuit-cream-strawberries dish and gives it a bit of French flair by making the biscuits out of ladyfinger batter, and suggesting the addition of a dollop of roasted strawberries with the dish. I, in my infinite wisdom and eagerness to eat shortcake, did not make the roasted strawberries, but they sound delicious and I dare say would pump up the flavour very nicely. I’d never made ladyfingers before, and I was surprised with how easy they are to make! Beat some egg whites, fold in the egg yolks, add some flour and corn starch, and bam! you’ve got ladyfinger batter. You can mix up the batter in the time it takes to preheat an oven to 400 degrees, and given how quickly that can happen with the latest ovens, that’s saying something. I piped the circles of batter that Dorie talked about, as well as the traditional ladyfinger shapes, and then dotted the remaining parchment paper space with small dots. The batter baked up very quickly, with a nice light golden colour, although if I had to do it again, I’d probably pipe a second layer of batter on top of the first, as they turned out rather thin. Not a ladyfinger dot to be seen. To make the whipped cream, I chilled my mixer bowl and beater in the freezer, which made the cream and icing sugar mixture whip up verrry quickly. Super quickly. Like, turn-my-back-to-put-the-biscuits-on-a-plate-quickly. Which really works for me, because the quicker the recipe, the faster I can eat the results! Put down the camera and eat me already! Sincerely, Strawberry Shortcakes. To serve, I put two ladyfinger rounds on a plate, piped the whipped cream on top, and spooned macerated strawberries over it all, then topped it off with another ladyfinger round. The DH and I dug in! I was going to take a photo after the first bite, but it was just too delicious. 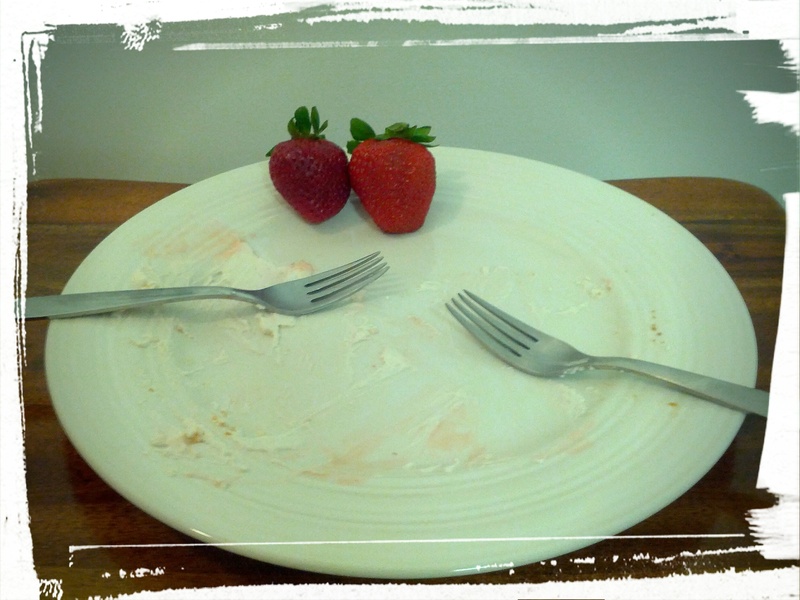 So delicious that after five minutes, all that was left was the empty plate. And the garnish. Which I then ate. I also packed one away for my lunch tomorrow. Salad plus a strawberry shortcake. Now that’s my kind of balanced meal! So yes, it was a good recipe! Quite easy to make, tasty to eat, and looks good too. I’ll make this one again, and you should too! And then invite me over to eat them with you, yes? Ah, mon ami, you are too kind! This entry was posted in Cook-a-Longs R Us, Desserts Not Otherwise Categorized on June 23, 2015 by Margaret. 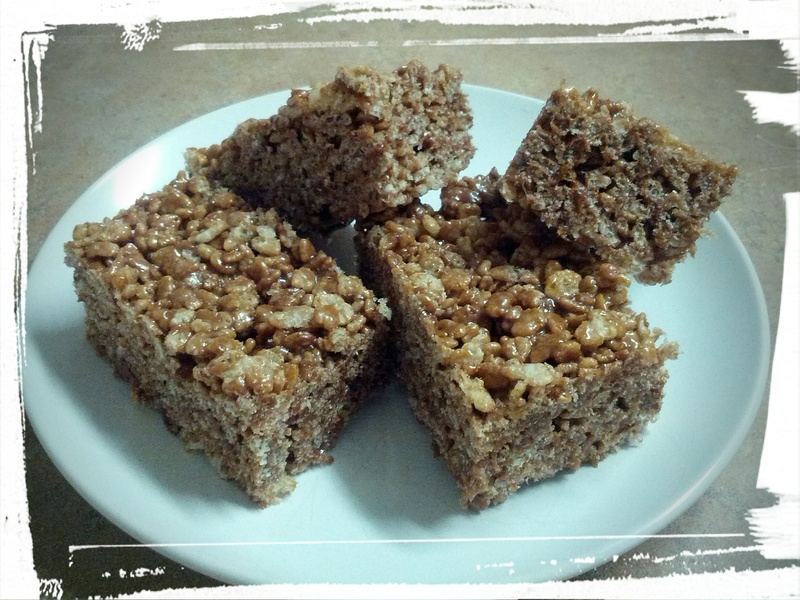 Nutella Rice Krispie Squares — Kid-riffic! Also great for your neighbourhood chocoholic. Chocolate-y, chewy squares of yum! A number of weeks ago, my on-line bake-a-long group made a recipe involving Nutella. While the recipe only called for a small amount of Nutella, I, being the chocoholic that I am, managed to eat the rest myself. And promptly bought another jar. I couldn’t eat the entire second jar by myself, so I used up some of it to make Nutella Rice Krispie Squares! If you have kids, they’ll love this! Or if you’re a chocolate-lover, you’ll love this. Even the DH loved this, and he doesn’t even like chocolate. In other words, they’re tasty! Melt butter and marshmellows in a pan over medium heat. Stir in Nutella until mixed, then remove from heat. Fold in the vanilla extract. Stir in the Rice Krispies cereal until thoroughly mixed. Pat the mixture into a buttered lasagna pan. Chill in fridge. Cut into squares and devour. Pro Tip: Butter your hands before patting the mixture into the pan for cooling. This helps you spread it evenly, and prevents it from sticking to your hands! Variations: I imagine that you could try this with other cereals. Or you could mix in some peanut butter for a peanut butter cup-style treat. Or drizzle melted chocolate on top. Or…well, you tell me! What’s your favourite mix-in? I made a batch of these and they were so tasty that they disappeared within a few days. So I made another batch! I mean, I AM a chocoholic! Cocoa-riffic! So tasty! And dairy-free too (except for the yummy, yummy Smarties). 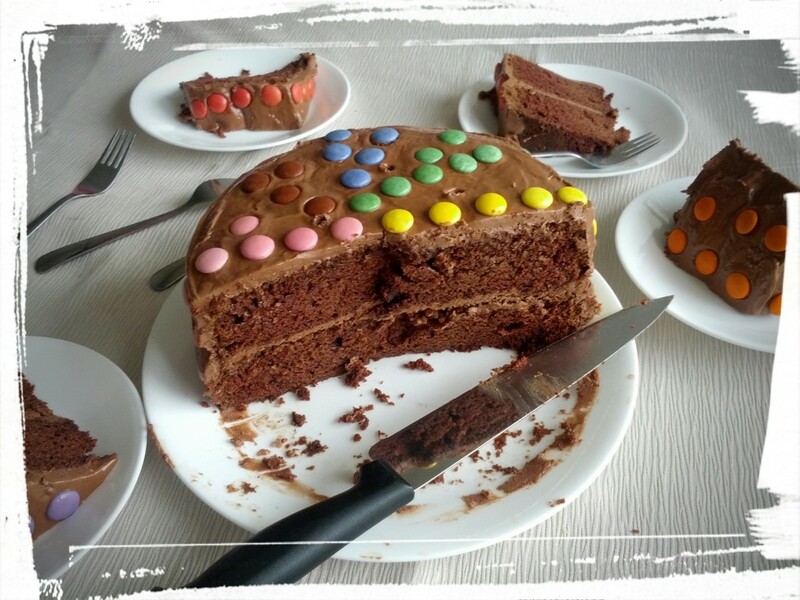 In case you doubt my chocoholic status, let me present exhibit A: my sister made me a birthday cake recently. Chocolate cake, with chocolate icing, covered with chocolates. A favourite from my childhood that tastes just as good as an adult. Brunch? Don’t mind if I do! Next Post: Strawberry Pannacotta — a fancy, easy dessert to impress non-veg guests. This entry was posted in Uncategorized on June 16, 2015 by Margaret. 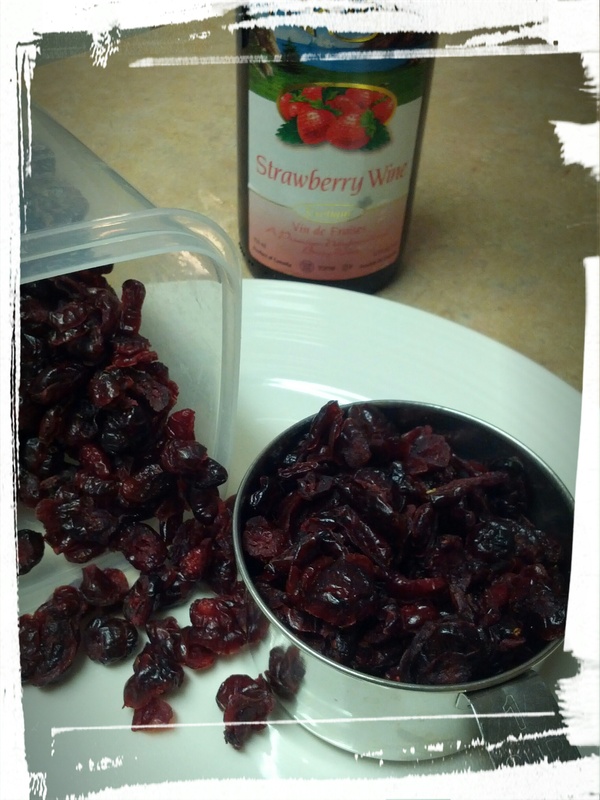 Strawberry Wine & Cranberry Brownies: BCM gone rogue! Ish. Esque? Rich, dense, chocolate-y brownies with a hint of tartness. As most of you already know, every two weeks, my online bake-a-long group makes another recipe from Dorie Greenspan’s cookbook, Baking Chez Moi. And most of you also know that when I’m cooking, I tend to substitute ingredients like crazy, and the recipes almost always turn out. There’s a reason that I call myself the Queen of Substitutions! 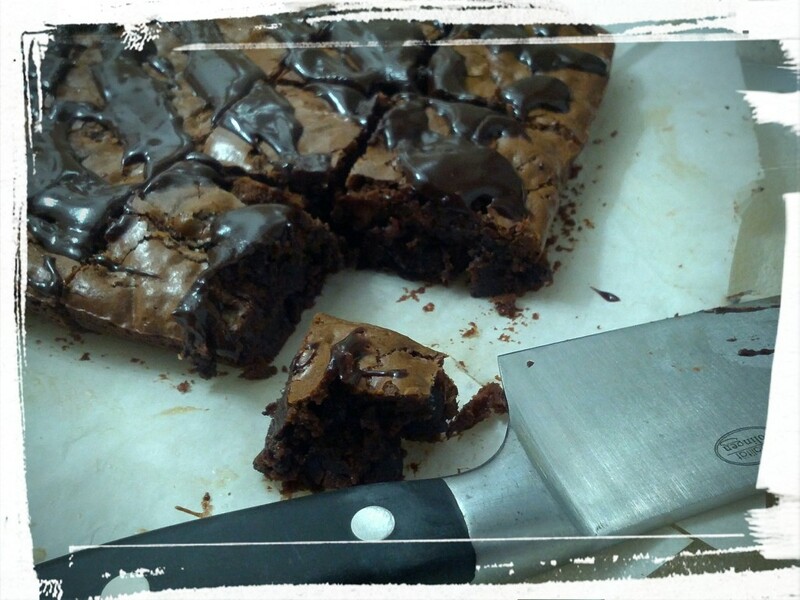 This week’s BCM recipe is Chocolate Cherry Brownies, which sounds delicious, doesn’t it? Rich chocolate brownies, studded with Port-soaked dried cherries and dark chocolate chunks. Can’t you imagine biting into dense little squares for a post-prandial treat? So. Dorie says to soak the dried cherries in a nice Port wine, although she also says that you can use cranberries instead of cherries, and a fruity wine instead of the Port. I realllllly wanted to use dried cherries — I just love the idea of cherries and chocolate! But that would have entailed a trip to the local Bulk Barn, and I just didn’t feel like an extra half hour’s walk in the rain after work today. So I pulled out the dried cranberries that I keep in my kitchen (usually used in salads). And I didn’t want to buy a bottle of port just for two tablespoons of wine, so I looked through my collection of cooking wines, and found a bottle of strawberry wine that my sister had given me years ago, and that I had only opened recently. Cooking wine = baking wine, right? If not…close enough. 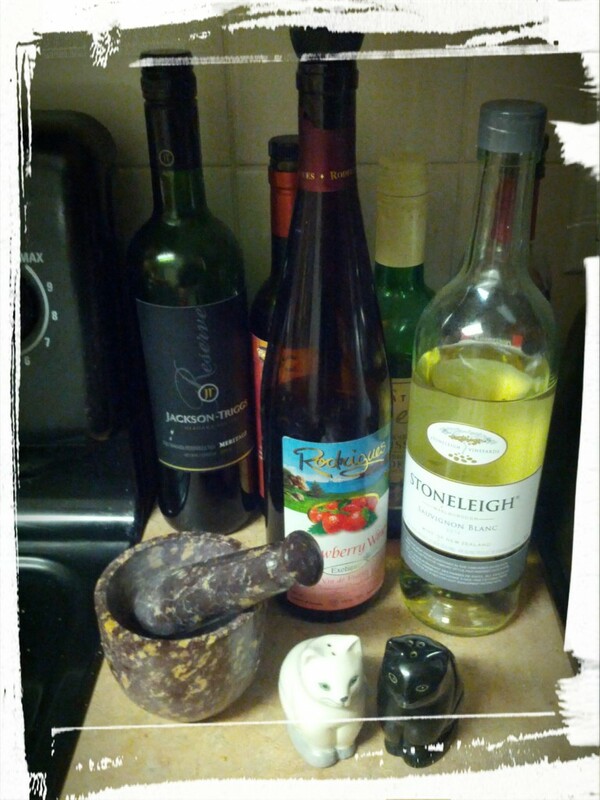 My cooking wine nook: red wine, white wine, strawberry wine, cooking sherry, and…red wine vinegar. Two kinds. I only keep salted butter in the house, so I did the very commonplace substitution of using salted butter and then ignoring the salt called for in the recipe. Interestingly, the recipe called for black pepper, which upon reflection, makes sense. Black pepper kind of calls out the chocolate notes a bit more, sort of like coffee does. I wonder why. Any food chemists out there care to enlighten me? I baked the brownies for 15 minutes longer than directed, which is unusual for me. 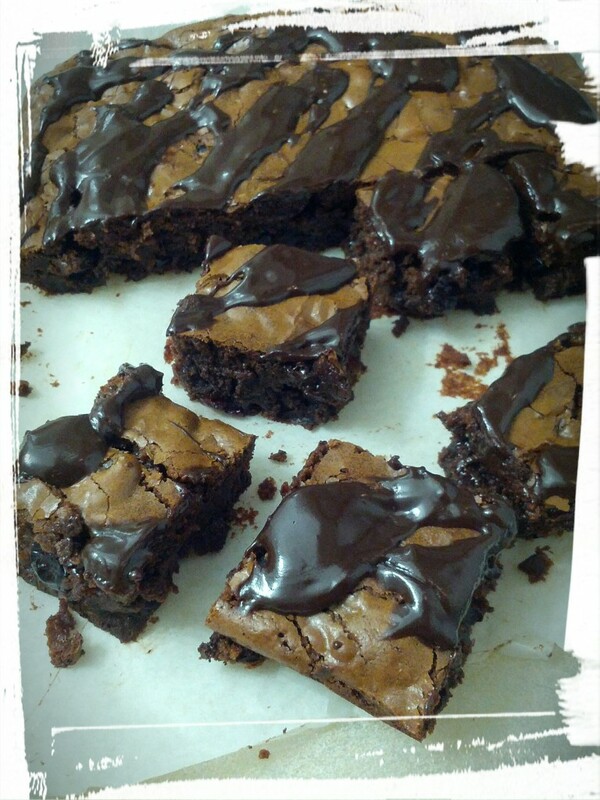 Usually I like my brownies all chewy and dense, but I wanted to make sure that these weren’t gooey and under-cooked. And also, the other bakers talked a lot about how much longer they needed to bake their batches, so I listened and learned. I was making dinner for the DH and I today, and I realized that I still had some ganache in the fridge, leftover from my Buttercream and Ganache-Topped Red Wine and Chocolate Cupcakes. Apparently I am the sort of person who routinely has leftover ganache in her fridge. Huh. Wonder what that says about me. 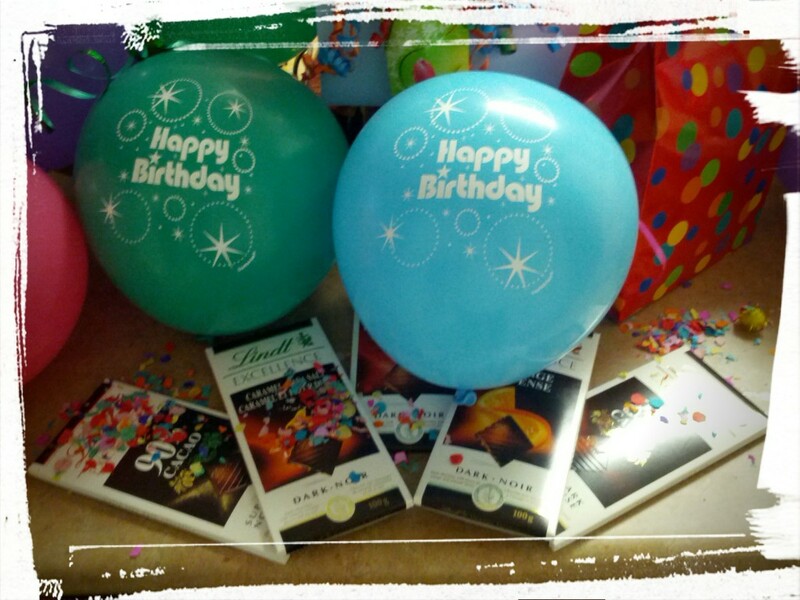 Or perhaps about my penchant for chocolate. Hmm. Time for some quality control! Or is it? Because my evening plans include curling up on the sofa with lots of pillows, a good book, and a plate of these brownies. Mmm…! I was finishing up this post, and I starting playing “Pump Up the Jam” on my laptop and danced my way into the DH’s man-cave, doing poor renditions of 90’s dance moves (the Running Man, anyone?). The DH laughed at me and followed me out to the kitchen where he is currently trying to get me to cut up the brownies. But they’re not properly cooled. [Edit: He’s gone to bed now. The brownies are also properly cooled now, so I shall try them. Coincidence? Only the DH knows for sure.] So time for some more dancing! Sing it with me: “Pump, pump it up….” Everybody dance now! Break it down. This entry was posted in Cook-a-Longs R Us on June 9, 2015 by Margaret.